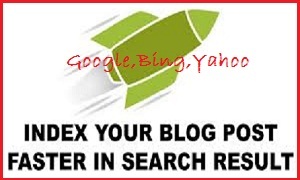 Dear Friends today i share a unique tips How to manually Index your blog each post Search Engine within a Second,Really it's like a Magic.It's a very small and useful tips that help your blogging life. Log in your blogger Gmail and give your blog post each url http://www.google.com/addurl/ and give captcha correctly..
Just Give your blog post each url http://www.bing.com/toolbox/submit-site-url and give captcha correctly ok done. If you have problems just drop your comment below..